This is a very versatile landscape product. The multi-colored yarn provides an authentic color and the added thatch can simulate dormant grass. 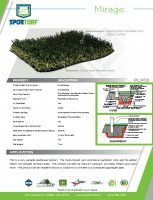 This product can also be used for walkways, pet areas, fringes, and much more. This product can be installed indoors or outdoors on concrete or a compacted aggregate base.